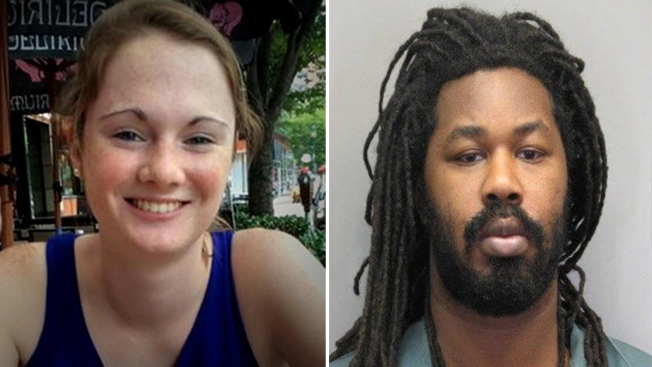 L-R: Hannah Graham; Jesse Matthew Jr.
A judge is set to consider several pretrial motions in the case of the man charged with abducting and killing University of Virginia student Hannah Graham. Jesse Matthew Jr. is charged with capital murder in the September 2014 disappearance and death of 18-year-old Graham. His trial is set for next summer. Albemarle County Circuit Judge Cheryl Higgins is set to consider about a dozen defense motions at Thursday's hearing. Among them is a request that she bar people in the courtroom from displaying any symbols supporting Graham. The county's chief prosecutor has filed court papers opposing that motion and most others. Earlier this summer, Matthew entered an Alford plea in a separate sexual assault case dating back to 2005. An Alford plea is not an admission of guilt, but an acknowledgment that there is enough evidence to convict. Testimony linked him to DNA found under the fingernail of a 26-year-old woman who was sexually assaulted in Fairfax in fall 2005. Matthew is being held without bond and will be sentenced in the Fairfax case Oct. 2.